Nine Inch Nails is an American industrial rock project, founded in 1988 by Trent Reznor in Cleveland, Ohio. As its main producer, singer, songwriter, and instrumentalist, Reznor is the only official member of Nine Inch Nails and remains solely responsible for its direction.Nine Inch Nails' music straddles a wide range of genres, while retaining a characteristic sound using electronic instruments and processing. 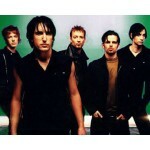 After recording a new album, Reznor (until the 2009 Wave Goodbye Tour) usually assembles a live band to perform with him. The touring band features a revolving lineup that often rearranges songs to fit a live setting. On stage, Nine Inch Nails often employs visual elements to accompany performances, which frequently include light shows. Underground music audiences warmly received Nine Inch Nails in its early years. Reznor produced several highly influential records in the 1990s that achieved widespread popularity: many Nine Inch Nails songs became radio hits;two Nine Inch Nails recordings have won Grammy Awards; and their entire catalog has reached record sales exceeding over 30 million albums worldwide, with 11 million sales certified in the United States alone.In 1997, Reznor appeared in Time magazine's list of the year's most influential people, and Spin magazine described him as "the most vital artist in music. "In 2004, Rolling Stone placed Nine Inch Nails at 94 on its list of the 100 greatest artists of all time.Despite this acclaim, the band has had several feuds with the corporate side of the recording industry. In 2007, these corporate entanglements resulted in Reznor announcing that Nine Inch Nails would split from its label and release future material independently. Since 1989, Nine Inch Nails has made eight major studio releases. The most recent releases, Ghosts I–IV and The Slip, both released in 2008, were released under Creative Commons licenses (BY-NC-SA). Both were initially released digitally, with physical releases coming later. The digital release of The Slip was made available completely free of charge. Nine Inch Nails has been nominated for twelve Grammy Awards and won twice for the songs "Wish" and "Happiness in Slavery", in 1992 and 1995 respectively.